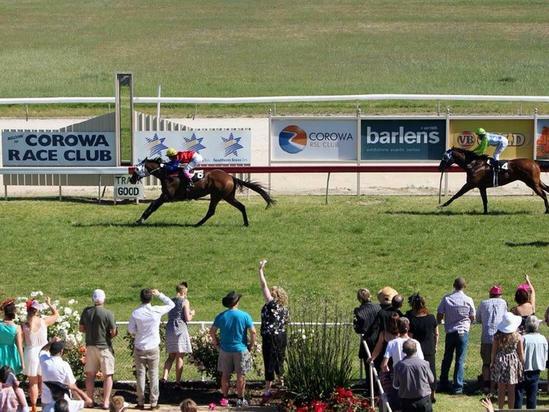 The Corowa race club meeting on Tuesday, July 3 will see 8 events to be run under fine conditions the track is currently rated a soft five the rail position is in the true the entire course. The first of the stable runners will enter in race two in a Corowa race club maiden plate over 1300 m with consistent place-getter Collis to be ridden by Nick Souquet jumping from barrier six with a current field of 14 to run. When well in the market at debut, slowly away; 3rd of 12 starters at Wodonga 3yo+ Mdn May 19 over 1200m, 2-1/4 len behind Last Boy Scout carrying 56.5kg. Second-up 3rd of 9 runners at Wodonga 3yo F Mdn Jun 16 over 1200m, on rain-affected going; 1/2 len behind Georgia's Host carrying 57kg. Race 4 will see two Craig Widdison runners in the Corowa race club SDRA Winter handicap over a mile with Hot Ruby to be ridden by Corey Parish jumping from barrier 4 & Baby Jack third up from a spell Brendan Ward to ride jumping from barrier eight with a field of 14 to run. Last outing 5th of 8 starters at Albury Open Hcp Jun 18 over 1400m, on heavy track; 3-1/4 len behind Man Of Peace carrying 56kg. Before that lame after race; always well back ran last at Sandown-Hillside (Bm70) May 9 over 1800m, 17-3/4 len behind Laughing Heir carrying 59kg. Third-up and won third-up in the past. First-up 8th of 12 starters at Echuca (Bm58) May 10 over 1312m, on slow going 4-1/2 len behind Toorak Warrior carrying 63.5kg. Last start eased back early on 5th of 10 runners at Wodonga (Bm64) Jun 16 over 1400m, in the wet; 5-1/2 len behind Frankly Harvey carrying 60.5kg.